A cancer diagnosis is always shocking, but the sickness of a parent is an especially scary time for kids. “The Year My Dad Went Bald: A tale of cancer, chemo and coping with a cold head,” is the story of one little boy’s experience with his father’s diagnosis and treatment for cancer and how his family pulled together to help his dad get better. 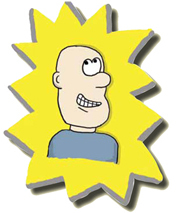 Check out this audio slideshow to see how--and why--Brian Kraft made "The Year My Dad Went Bald." 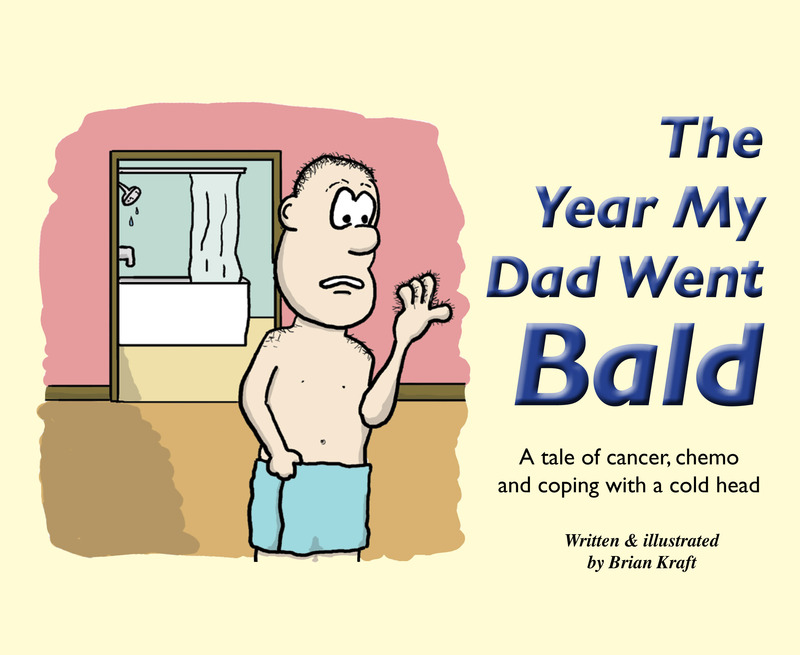 Written by Non-Hodgkin’s Lymphoma survivor Brian Kraft of Columbus, Ohio, and told from the perspective of his 9-year-old son, “The Year My Dad Went Bald,” is a heartwarming and informative tale that will provide inspiration and guidance to any family facing a life-threatening illness. Available in paperback for just $7.99 (plus shipping). For questions or to order multiple copies, please email us! If you order a copy by clicking here, we will donate your copy to a local library or cancer center. Just finished the book – it’s great! Loved the artwork, and the writing was top-notch. I’m sure this will be a great help to any child in the same situation. I even learned stuff, and I’m 44! How did that happen? I guess it was the educational sidebars in the book! I am from South Africa and would like to buy the book for my sons. Where is it available in SA? Thanks so much for your note. We will absolutely ship “The Year My Dad Went Bald” to South Africa. We will get a shipping price and be back in touch today! Best of luck to you and your family. I have added a button on the website for international orders. It will be just an additional $6 to ship to South Africa. What a delightfully drawn and wonderfully told story. Do not hesitate to buy this book for any child affected by a loved one’s cancer. I especially appreciate how well you have handled the scary aspects of sickness. Addressing these matters directly but tastefully conveys your respect for your audience without frightening the reader further. Your honesty and candor makes your story endearing and engaging from the dreaded phone call to the celebratory return of (a slightly revised) sense of normalcy. I want to buy this book for my cousins (21 and 18). Is it appropriate for someone their age? I was watching the news this morning and saw you and your son talking about your book. I am writing in response to that in the hope that I could get two free autographed books, 1 for me to read and review and the other to use as a giveaway on my website. My website is a family oriented website aimed to provided information for all kid friendly events in the NE Columbus area, as well as craft ideas, recipes, and reviews. I am very fortunate to have not had to deal with what your son had to as a child, but I am sure that at least one of my readers and subscribers knows a child that has. I would love to beable to pass along the information for your book! I have purchased this book for my boys 6 and 9 as I have non hodgkins also. i believe that it will help them understand better what I am going through. Please autograph it for me if possible. Please know we are thinking of you in this challenging time and wishing for you and your family only the best. Brian will absolutely autograph it. Feel free to email us your sons’ names for personalization, if you wish, at theyearmydadwentbald@wowway.com. hi, I just read your story this sounds so familiar i graduated in 84 from nahs i also had lymphoma 13 years ago i loved you article. i had 2 small kids at the time. Thanks for sharing your story. So great to hear from you–hope you are doing well now! Thank you so much, and please know we are thinking about you. Brian, too, was Stage III, but he responded really well to chemotherapy and we certainly hope (and expect!) the same for you. Please let us know if you have any questions we can help with. Best wishes to all of you! I am a materials coordinator for the Canadian Cancer Society’s Cancer Information Service and would like to obtain a copy of your book to possibly share with our clients. Please let me know how I can get a copy. Was such a pleasure meeting you at the GNE NACCO meeting yesterday. As I said yesterday, your story is an inspiration and fuel for why I do what I do. Thanks so much for sharing your story. I am a Canadian Roche employee who had the pleasure of meeting Brian at the meeting in San Francisco last week. I couldn’t wait to get the book home so that my 11 year old son and 9 year old daughter could read it. My son was deeply touched by Brian’s story. They both asked me a lot of questions. It allowed me an opportunity to talk to them about what I do at Roche and to explain how hard we are working to help people like your husband. Knowing we have made a difference in someone’s life helps us to keep on fighting. Thanks for the autographed copy! Hi Jackie. It was great to meet you. I can’t thank you and your colleagues at Genentech/Roche enough for the warm reception I received. Glad to hear that your family enjoyed the book. Thanks for doing what you do and hope to see you again sometime.